Barely three months after the sensational premiere of the BMW Zagato Coupé, BMW and Zagato are turning heads again at the 2012 Pebble Beach Concours d’Elegance with the fruits of their latest collaboration. Created in just six weeks’ worth of lavish handcraftsmanship, the BMW Zagato Roadster represents another masterful example of the traditional coachbuilder’s art and an elegant take on the sporty, masculine marker laid down by the BMW Zagato Coupé. At the Pebble Beach Concours d’Elegance, this one-of-a-kind automobile finds itself in the best possible company. Every year connoisseurs and exponents of coachbuilt classics come together on California’s Pacific coastline to gorge on, mull over and be amazed by an array of automotive exotica. Indeed, you’d be hard pressed to find a more appropriate venue for the premiere of the BMW Zagato Roadster. The next stage of a successful collaboration. The decision to launch another collaboration between BMW and Italian coachbuilder Zagato was made only a short time after the BMW Zagato Coupé took its first bow. Encouraged by the positive reaction to the Coupé, Adrian van Hooydonk, Senior Vice President BMW Group Design, and Andrea Zagato soon agreed to take their partnership a step further. On the menu this time would be a Roadster model. “We set ourselves the challenge of preparing the car in time for the renowned Pebble Beach Concours” explains van Hooydonk. The BMW Zagato Roadster was duly conjured up in record haste, with only six weeks separating the first design idea from the finished model. 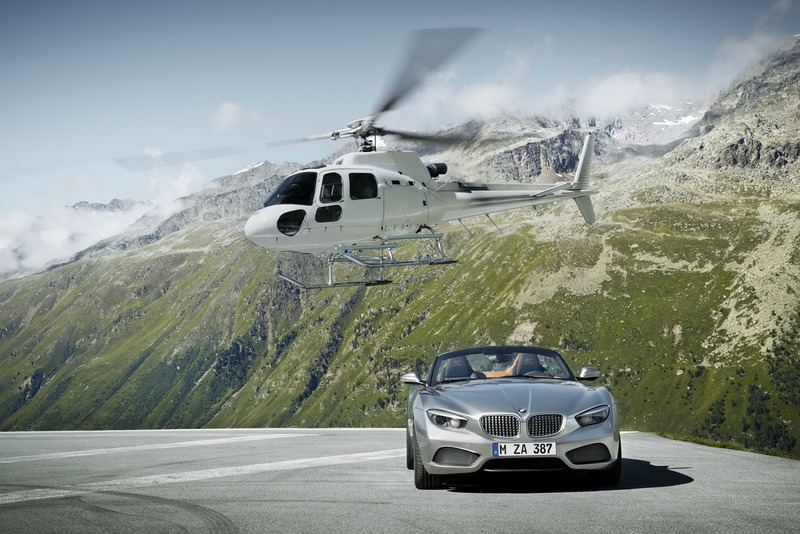 “It was only with the expertise of both companies in the manufacture of high-end one-off cars and another display of outstanding teamwork that we were able to finish the car on schedule,” adds the BMW design supremo. Andrea Zagato picks up on the theme: “Our success in finishing the car in such a short space of time shows what is possible when two successful companies pool their resources” says Zagato. “BMW is a high-achieving carmaker boasting a vast well of knowledge and technical capability in this area. 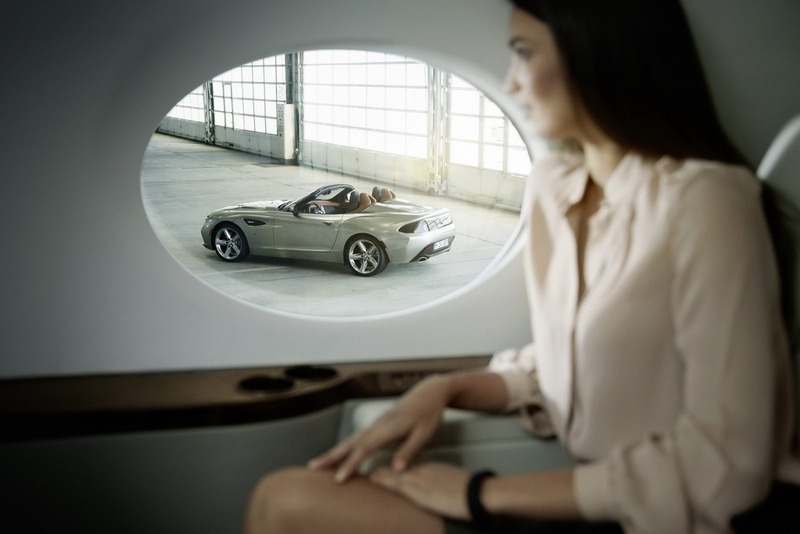 When you combine that with our expertise in the creation of micro-series cars and our streamlined production processes, everything is in place to produce a beautiful model like the BMW Zagato Roadster in double-quick time”. The design – Italian finesse meets Bavarian roadster tradition. 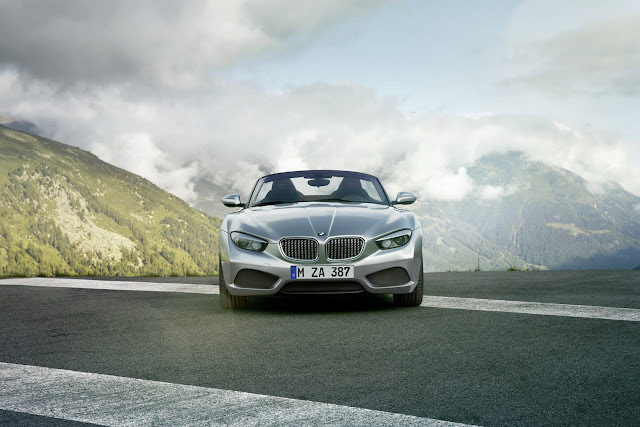 It quickly became clear that the partnership’s next jointly developed model would be a roadster. Indeed, no other concept embodies the pure fascination of motoring quite like this breed of car. 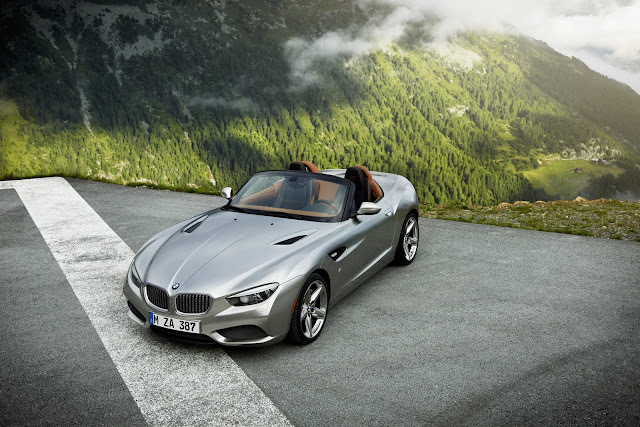 With the roof down, two seats and exceptional performance, it allows the driver to experience dynamic thrills and driving pleasure with all the senses. To this heady blend the BMW Zagato Roadster adds the fineries of the Italian “dolce vita”, its designers succeeding in lending the car its own distinct character without blurring its family ties. 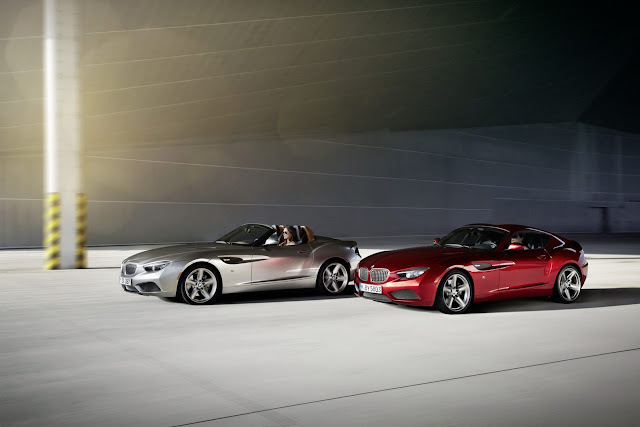 BMW and Zagato can both look back on a long and successful tradition of building roadsters, and the BMW Zagato Roadster sees their respective design DNAs melting into one. There is, of course, more to designing a roadster than slicing the roof off a coupé. “This car is not designed only as an elegant convertible, but also as a masculine and extremely dynamic sports car which evokes a powerful driving experience,” says Zagato chief designer Norihiko Harada, describing the design philosophy behind the BMW Zagato Roadster. 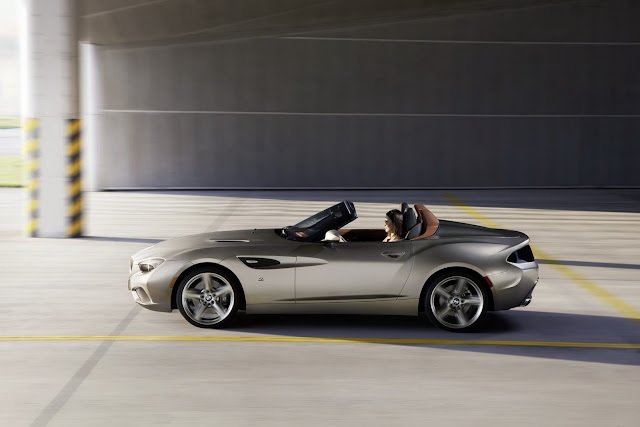 Like the BMW Zagato Coupé, the Roadster is ready to drive – and intended to be driven at high speeds. The car’s proportions make no secret of the special driving experience that awaits the driver. The sweeping hood and long wheelbase pin the driver back close to the driven rear wheels. There, he sits low down in an ultra-sporty position inside the cockpit. The taut, hallmark BMW surface treatment and Zagato’s clearly defined distribution of visual mass lend the BMW Zagato Roadster an athletic appearance – poised and eager, demanding to be driven. 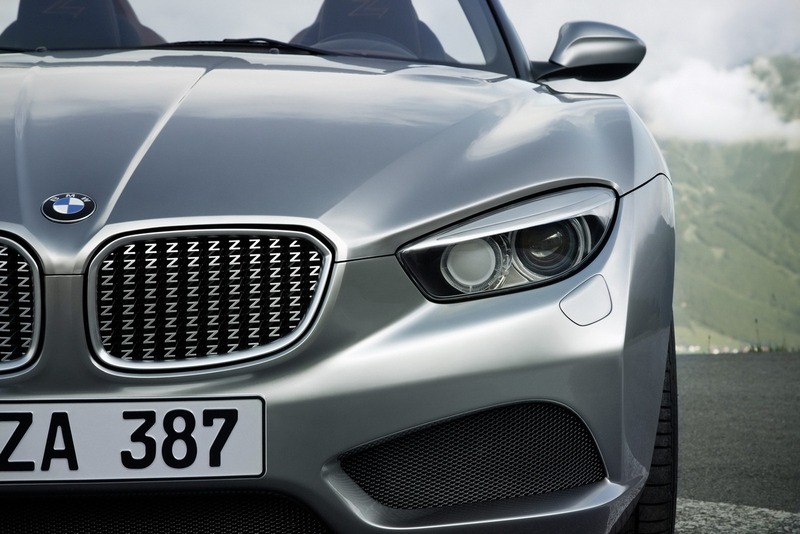 A low-set kidney grille, complete with intricate z-design grating, as well as focused twin circular headlights and a three-dimensional front apron shape the expressive face of the BMW Zagato Roadster, as they do the front end of the Coupé. It is this area of the car that provides the stylistic link between the two models, giving them a clear identity, reflecting their family ties and, at the same time, making them easily recognisable. Overall, the BMW Zagato Roadster’s front end is very three-dimensional, wide and powerfully formed. 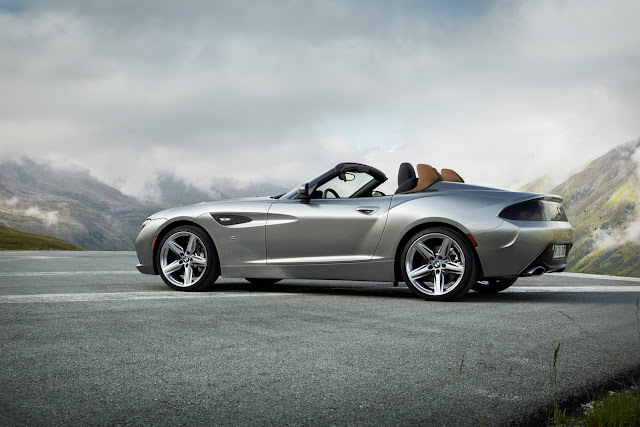 The nose surges forward dynamically, dipping down close to the road, and allows the BMW Zagato Roadster to cut an agile figure, crouching as if about to pounce. The contoured hood extends this aura of dynamism with its sweeping lines and taut surfaces, while a pair of air intakes carved into the hood supply the engine compartment with extra air and hint at the brawny powerplant inside. The focused headlights accentuate the car’s driver-oriented character and high-speed concept; the “razorlight” – a precise LED light strip set into the matt surface above the headlights – finishes these elements off with an extra touch of class. Sitting low between the headlights is Zagato’s take on the BMW kidney grille, featuring matt kidney surrounds. A stand-out detail here – and one shared with the BMW Zagato Coupé – is the use of a large number of small matt-sheen Zagato “z” letters to make up the kidney grating. This arrangement injects added depth into the grating and lays on a high-quality accent for the front end. The flanks of the BMW Zagato Roadster reflect the extrovert character of its Coupé sibling. Here, the clearly defined distribution of visual mass and eye-catching tail of a Zagato blend with the hallmark surface treatment and use of forms familiar from BMW models. 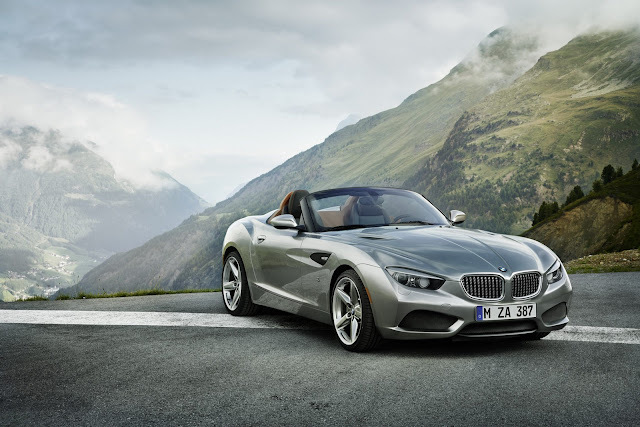 Together, they imbue the BMW Zagato Roadster with a distinctive and athletic allure. The black colouring of the A-pillars allows them to fade into the background and set off the sculpturing of the car’s body even more effectively. 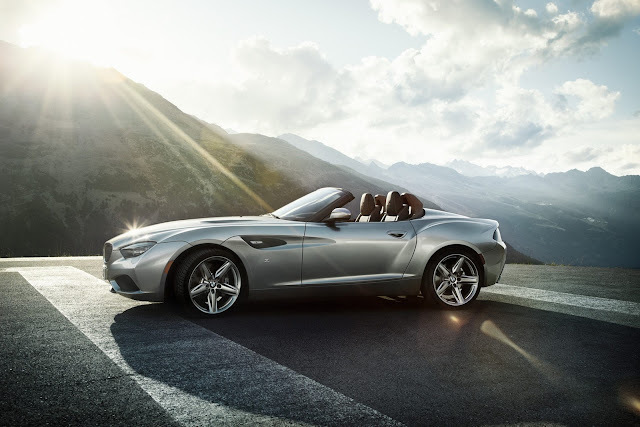 The BMW Zagato Roadster’s silhouette outlines a poised and alert presence, the car’s sweeping hood, long wheelbase, short overhangs and low rear end merging into a taut, sporty whole. The basic choreography of lines and surfaces is similar to that of the BMW Zagato Coupé, but subtle differences are noticeable at the rear. The tail end as a whole places a greater emphasis on elegance than that of the Coupé, which shows a sharper sporting edge. The Roadster’s lines are smoother here and the rear is lower-slung. Plus, a fine additional line forges a visual connection between the sill and the rear apron to round off the rear end design in style. Another noteworthy detail of the BMW Zagato Roadster are its roll-bars – an important design element of many roadsters and commonly an identifying feature. 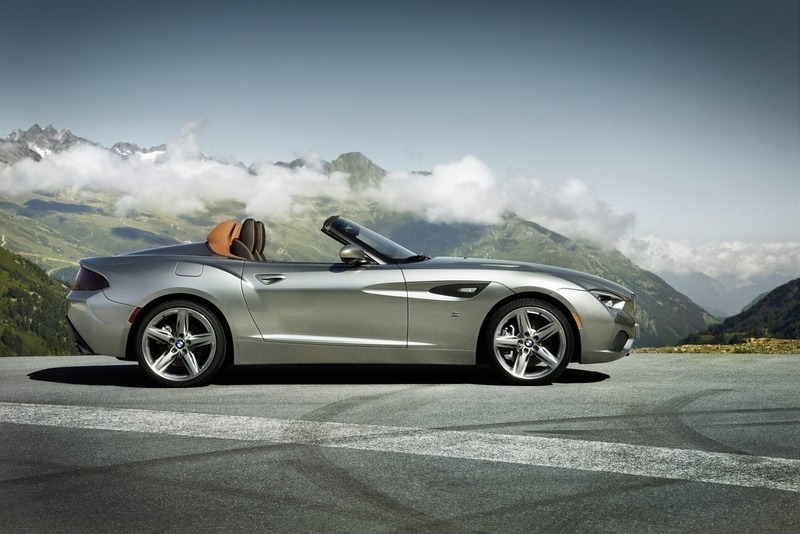 The roll-bars of the BMW Zagato Roadster are quintessentially Zagato. The designers took their inspiration for these technical components from an aircraft wing and experimented with their mass before settling on a dynamic forward-leaning focus and powerful structure. 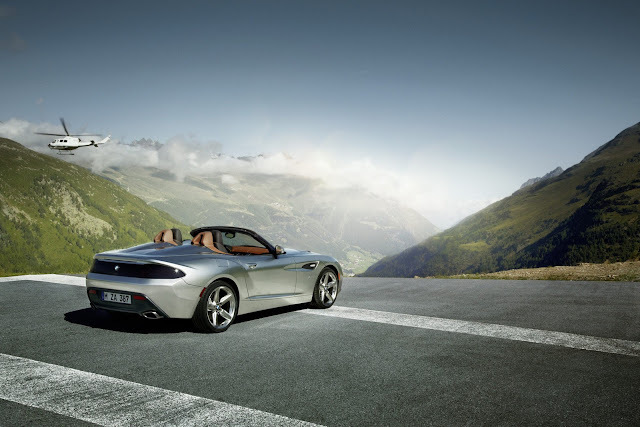 “The low, dynamic roll-bars, inspired by an airplane wing, are an eye-catcher that make the BMW Zagato Roadster recognisable from a distance” says Norihiko Harada. Their brown colour gives the roll- bars an even more prominent profile. Allow the eye to wander further back, and the car’s rump provides a harmonious conclusion to its overall silhouette. Other striking details include the air outlets adorning the Roadster’s flanks, which mirror the form of the hood vents and reproduce their dynamic theme. The silver “z” positioned below the flank vents references the BMW/Zagato collaboration. 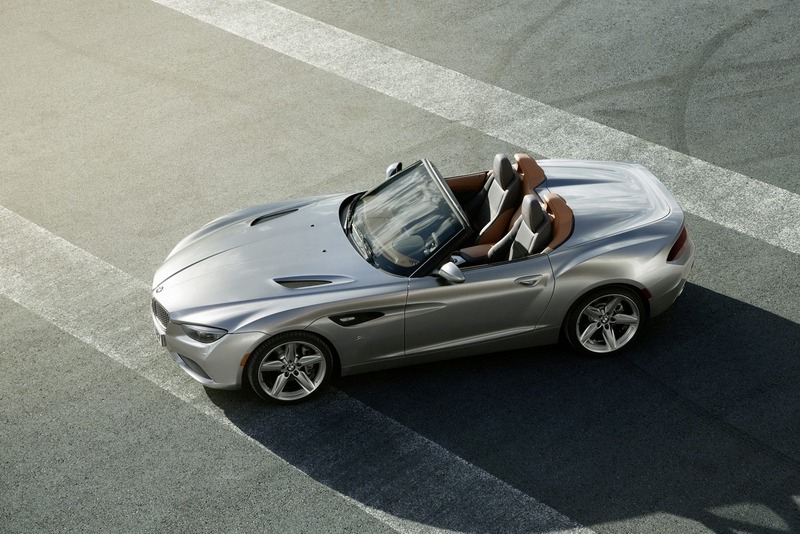 A bird’s-eye view of the car highlights the BMW Zagato Roadster’s interpretation of the hallmark Zagato double-bubble roof in the soft-top cover. 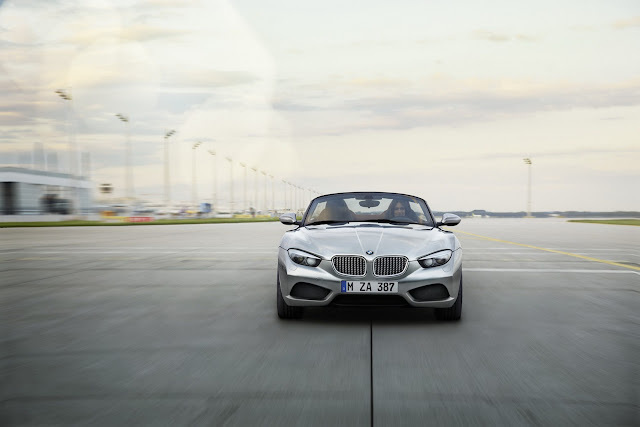 The cover uses this double-bubble element to extend the lines of the hood all the way to the rear, where it accentuates the muscular proportions of the rear-wheel-drive Roadster. 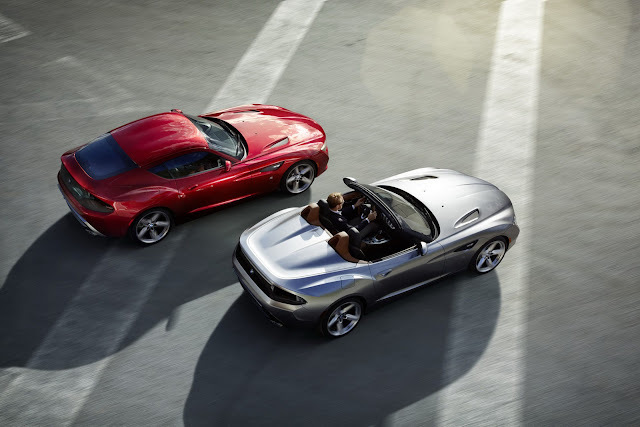 These two roof domes – the “doppia gobba” in local parlance – are a signature feature of Zagato design and can be found on almost every Zagato car. Sporty yet elegant rear-end design. The sharply chiselled tail of the BMW Zagato Roadster provides a fine advertisement for the exquisite talents of the Zagato body specialists. The rear end displays a seamless perfection, giving it a feel of quality – like a sculpture cast from a single mould. Here, the high degree of handcraftsmanship within the walls of the Zagato design studio and the company’s vast well of experience in working with surfaces and forms come resplendently to light. 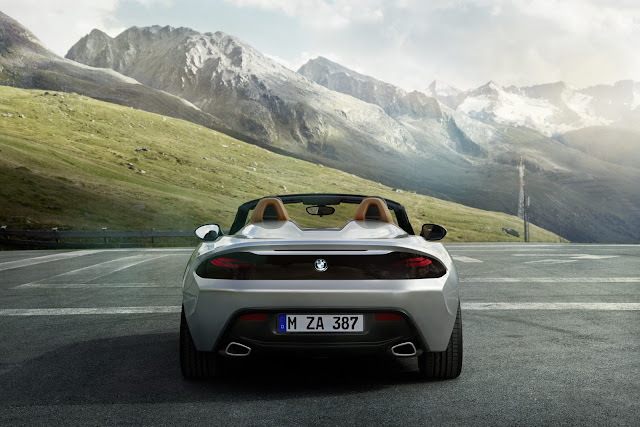 Taken as a whole, the rear of the BMW Zagato Roadster has a very broad, low-slung appearance, giving the car a wide stance and planted muscularity on the road. Like those of its Coupé counterpart, the BMW Zagato Roadster’s rear lights are arranged behind black tinted glass. The glass area extends in a shallow black band around the whole of the rear end, underlining its horizontal geometry. Beneath it, the dark diffuser gives the BMW Zagato Roadster a squat, powerful stance. Exhaust tailpipes positioned towards the outer edges of the rear add further emphasis, their matt finish contributing another flourish of quality. The body-coloured surfaces between the tailpipes draw the final lines in the distinctive, low-to-the-road and broad-set looks of the rear end. Founded by Ugo Zagato in 1919, today Zagato is the only automotive body manufacturer still in independent ownership. 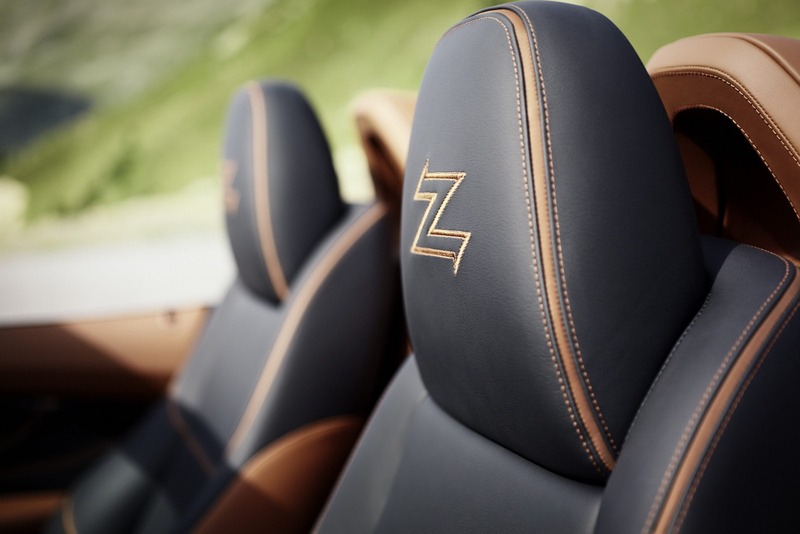 From its earliest days, Zagato has taken a minimalist and pared-down approach to its creations, very much in keeping with the Milanese tradition of design. Form takes precedence over details, thanks in part to technical considerations. Body designer Ugo Zagato learned his trade in – among other industries – aviation, where aerodynamics and lightweight construction play a central role. Zagato duly applied these principles rigorously in the construction of cars and soon celebrated a rash of race victories as a body construction partner to Alfa Romeo. The “necessary beauty” of aerodynamics and lightweight construction came to represent a maxim of design, one that has defined the form of every Zagato since. Today, with Andrea Zagato and Marella Rivolta-Zagato, becoming the third generation of his family to take his seat at the helm, the company describes itself as a design studio combining the emotion and handcraftsmanship of body construction with the precision of state-of-the-art technology. Zagato follows coachbuilding tradition in developing only the shell of the car and leaving the mechanics of the machine untouched. More than 200 Vmax concepts, special editions and micro-series have been created in this way down the years and find appreciation among connoisseurs and collectors the world over. Indeed, all Zagatos are coveted collector’s items today and worth many times what their original owners paid for them.